This blog post expects that you are familiar with an Entity Component System, if you don't know what an Entity Component System is, then you should look at the RustConf 2018 Closing Keynote. 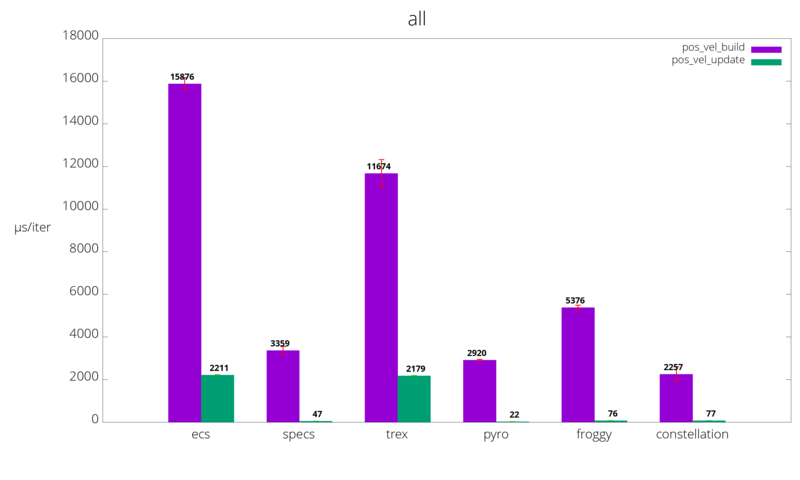 In contrast to many other ECS, iteration in Pyro is fully linear. Different combinations of components always live in the same storage. // A Storage that contains `Pos`, `Vel`, `Health`. // A Storage that contains `Pos`, `Vel`. The advantage is that iteration is always fully linear and no cache is wasted. The storage behind the scene is a SoA storage. This is very different from other ECS like specs where components live in the same storage that can be customized by the user. // Appends 99 entities with a Position and Velocity component. // Requests a mutable borrow to Position, and an immutable borrow to Velocity. // Common queries can be reused with a typedef like this but it is not necessary. // Retrieves all entities that have a Position and Velocity component as an iterator. This is only the single threaded benchmark because I haven't implemented multi-threading yet for Pyro. It is not a fundamental problem, I just haven't found the time yet to implement multizip for rayon. The benchmark is also too simplistic to be useful, so take it with a grain of salt. I am currently creating a more real world like benchmark, because I don't want to mindlessly optimize Pyro without any hard data. Although at the moment it is more of a personal playground than a benchmark. Overall my impression is pretty good, but there are also a few downsides to an ECS. I think understanding local concerns is generally much simpler in an ECS because you only use what you need. For example in the example above we iterate over all enemies and filter out the enemies that have a negative health and then we delete those entities. There could be thousands of different enemy types, but that complexity is completely irrelevant for this function. It is much easier to fully understand what a Player can actually do. Additionally it is easy to have incompatible components on an entity. An entity can have a position and velocity component, and then a function updates the position based on the velocity for every frame. Now there is also an Pathfinding component, which is used to navigate AI through the map. Having Position, Velocity and Pathfinding probably doesn't make much sense on the same entity. and then check at runtime which rocket you need to spawn. You could also make your missile generic. So we can create two different missiles, and because they have one different component type, they will end up in two separate storages. Now we can abstract over those missiles at compile time, and we can skip the runtime branch. Of course you can do that without an ECS too but this is very natural in Pyro. Also Pyro follows the mantra 'If there is one, there are many.'. Everything that you do, you do in bulk. You don't spawn a single rocket, iterate to the next explosion and then spawn another rocket. You collect all the rockets that you want to spawn and then you spawn them in bulk. Right now this requires an allocation but the allocation can be avoided in the future with custom allocators. I can't recommend it for any serious projects just yet. I only worked on it for under a week and there are some API deficiencies that I haven't addressed yet. I also haven't done much optimization and some parts of Pyro are implemented fairly slowly. If you want an ECS right now, you should use something like specs.